Here is the last card I did for my June Card Class. 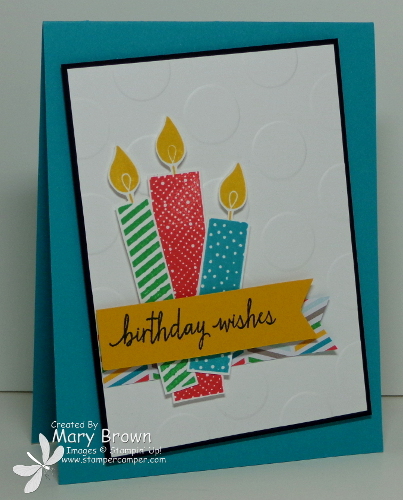 The Build a Birthday set is so good for making candles and I just love the colors in the Cherry on the Top dsp. I think I probably like using this set for candles more than I like using the images to make a cake! They are just so fun! I think this is just a fun birthday card. It would make anyone happy to get it and definitely is reason to celebrate! Whisper White – 3 3/8 x 4 5/8, run through the Large Dotted Embossing Folder and layer on Basic Black 3 1/2 x 4 3/4 and add to card front on an angle using dimensionals. Crushed Curry – 3/4 x 2 3/4, stamp greeting using Memento Black, cut into a banner and add using dimensionals. 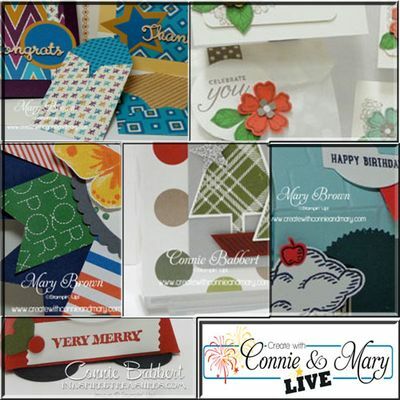 This entry was posted in Create with Connie and Mary and tagged Build a Birthday. Bookmark the permalink.